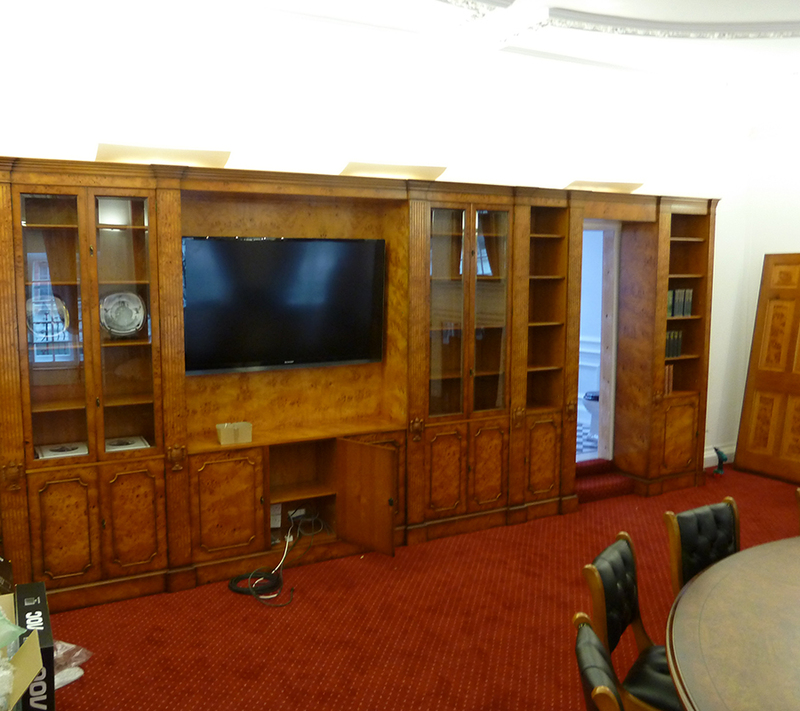 This is an example of a reproduction bookcase that we manufactured in Poplar for a boardroom in London’s Mayfair. 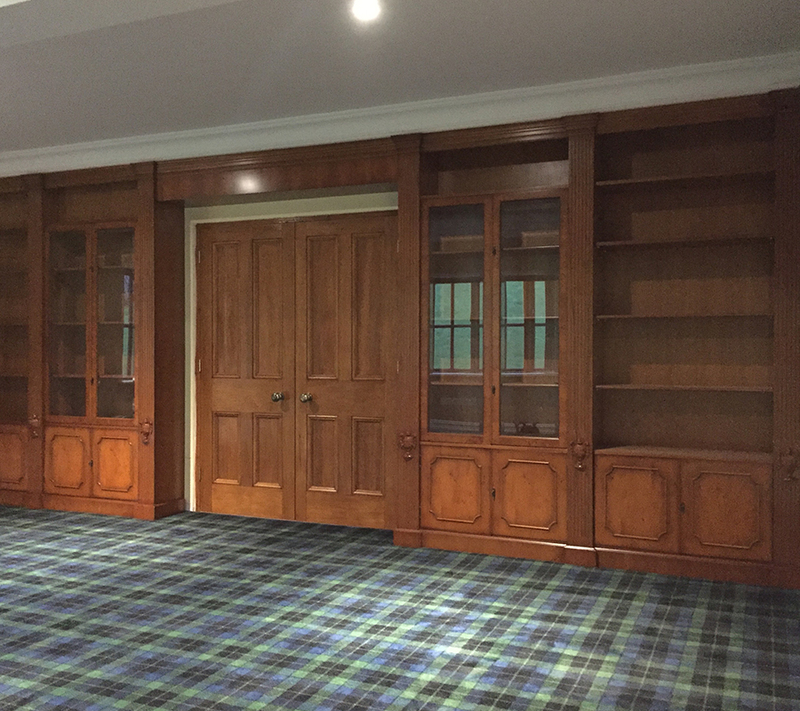 The bookcase had individual columns installed to give it extra character and was reinforced to be able to mount a large flat screen TV within the open display section. 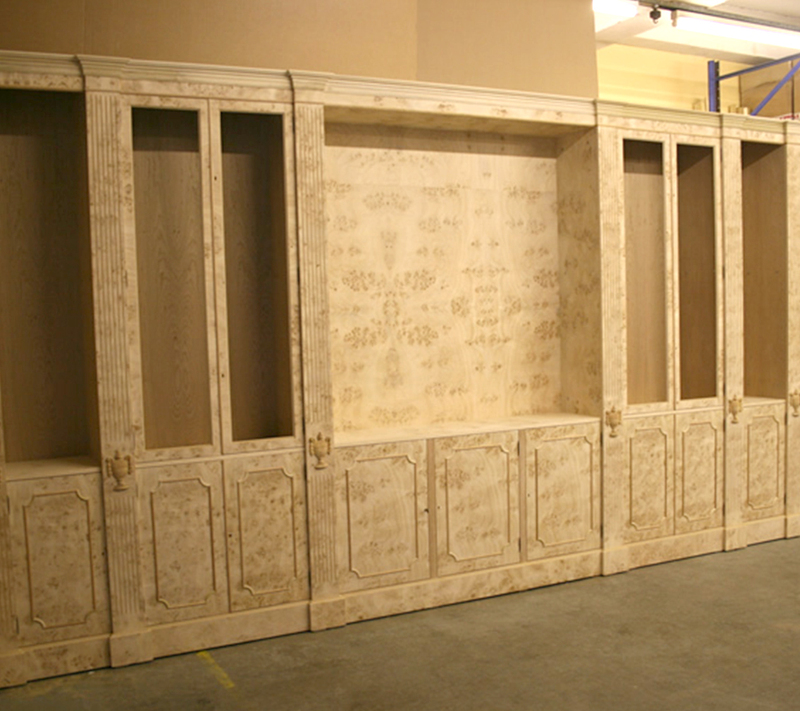 This was one piece from a large order of bespoke furniture that we handmade to the customers specific requirements. 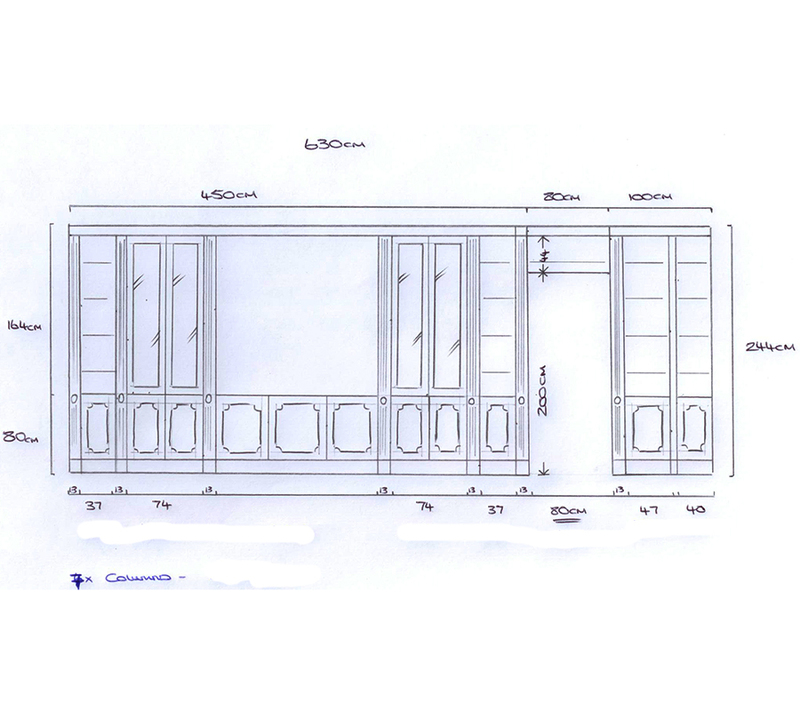 As a furniture manufacturer as well as distributor from various quality furniture makers, we are able to offer bespoke services in reproduction style and contemporary cabinets. In house we can produce bespoke pieces in a variety of wood finishes including Mahogany, Yew, Cherry, Oak, Burr Elm, Burr Walnut and Poplar. We are also able to offer other finishes and other solid woods based on your specific requirements. 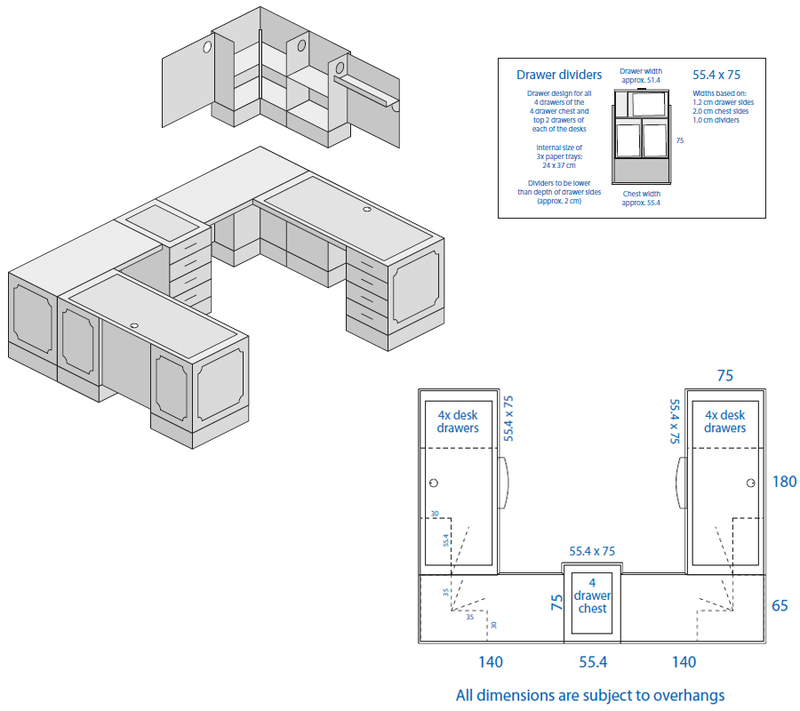 Below you will see some examples of some bespoke cabinets that we have manufactured to our customers own designs and specifications. 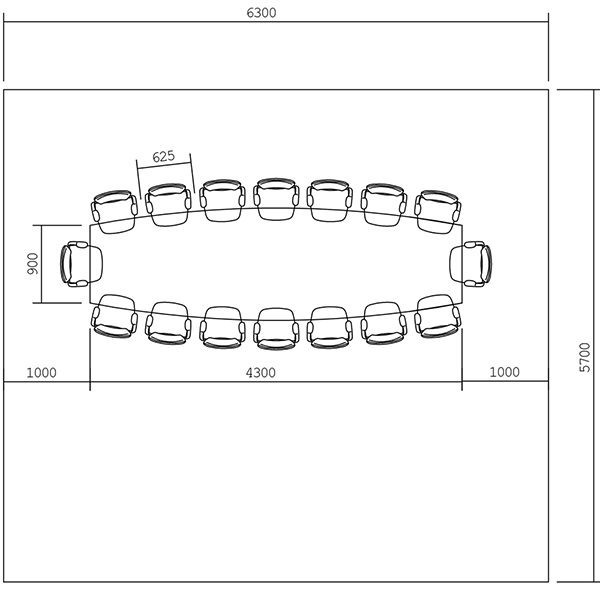 For more information or for a quote please contact us. You will see on our contact page that 1 image can be uploaded of your designs or pictures. If needed you can send a couple of separate uploads via our form. 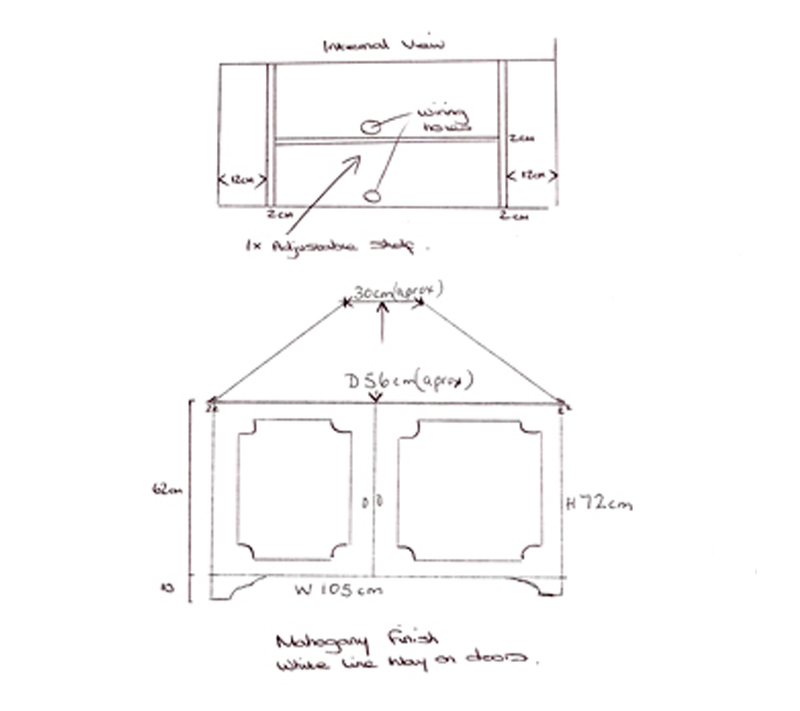 For a quote please send your sketch or design of what you would like us to quote including full dimensions and choice of wood. 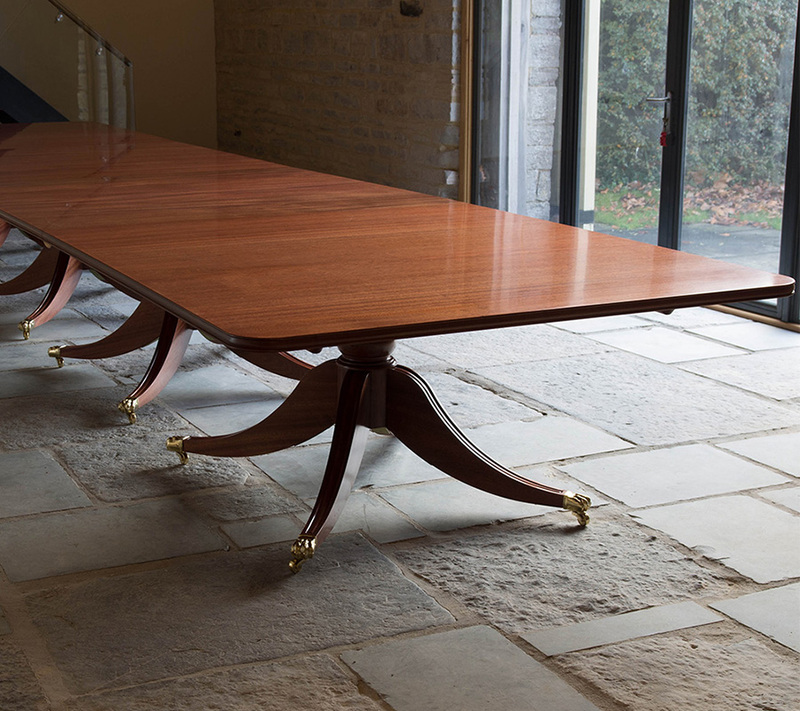 Here is a beautiful table that was made from solid mahogany to the customers own specifications and styled on an antique table that they currently had. 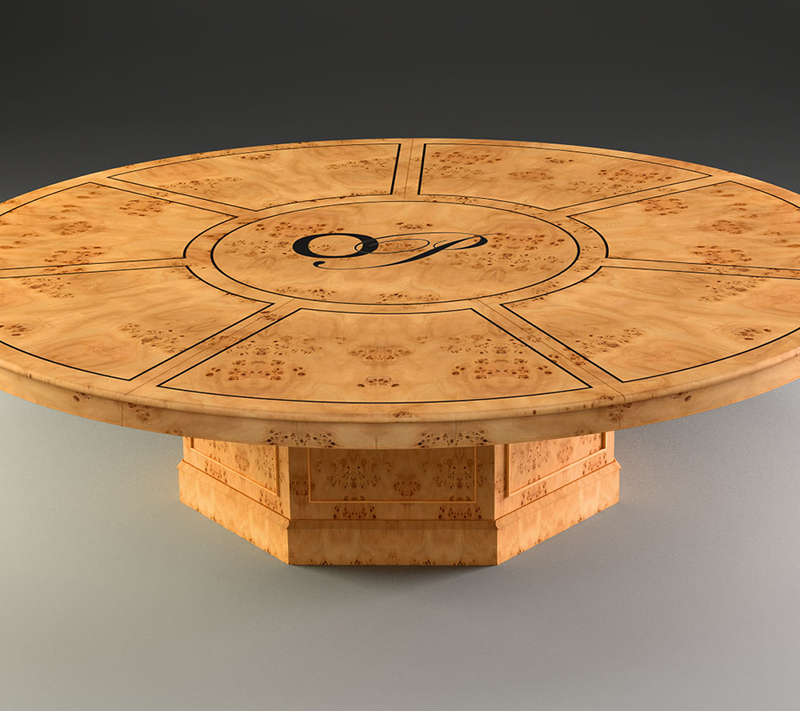 The table was made to separate with fillet ends that could be added to make 4 individual tables when not hosting dinner parties. 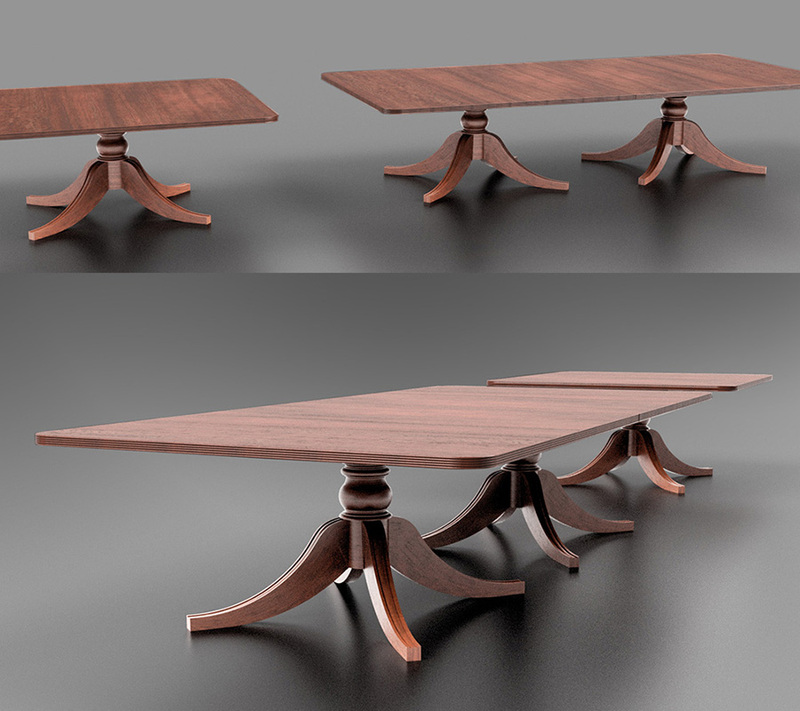 For this project we designed the table in CAD and then had it 3D modelled to show the client alternatives for them to choose the detailing they wanted for moldings, pedestal design and to help visualise how the finished piece would look. This is an example of a reproduction style modular bookcase that we manufactured in Poplar within our own factory in Enfield. 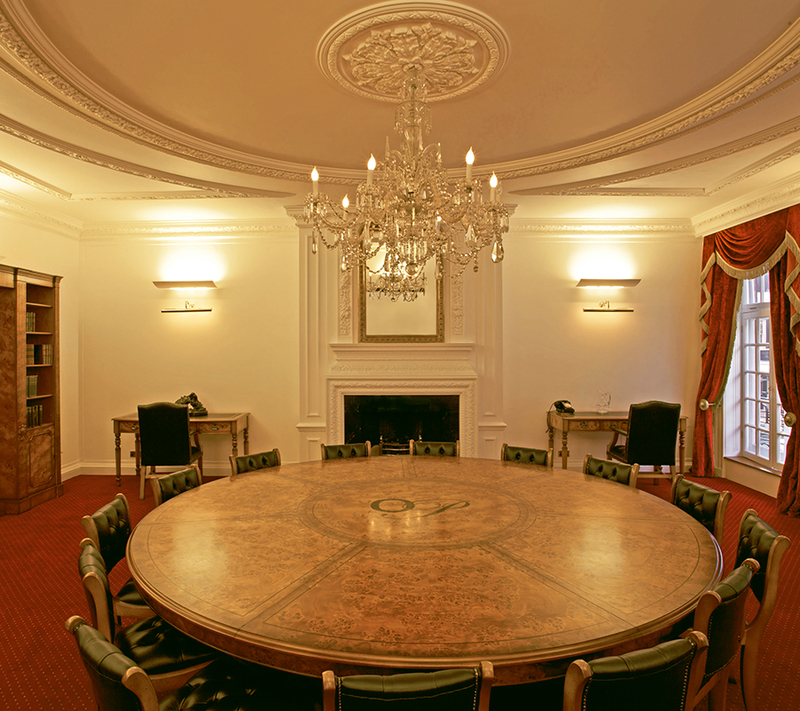 The client had a boardroom that they wanted to furnish with bespoke furniture in London’s Mayfair. 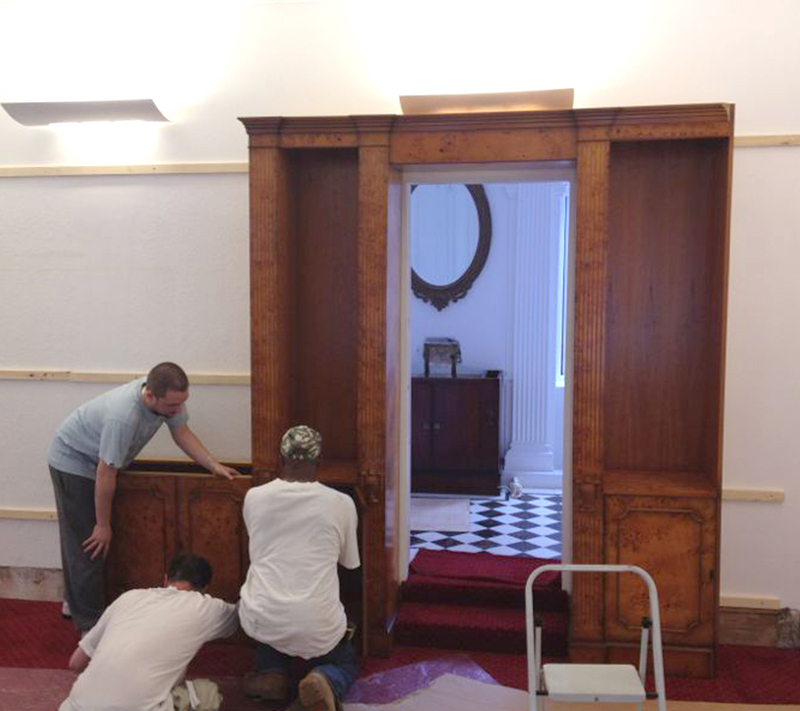 The bookcase was produced to hold a large flat screen television along with and open section for access to a doorway. 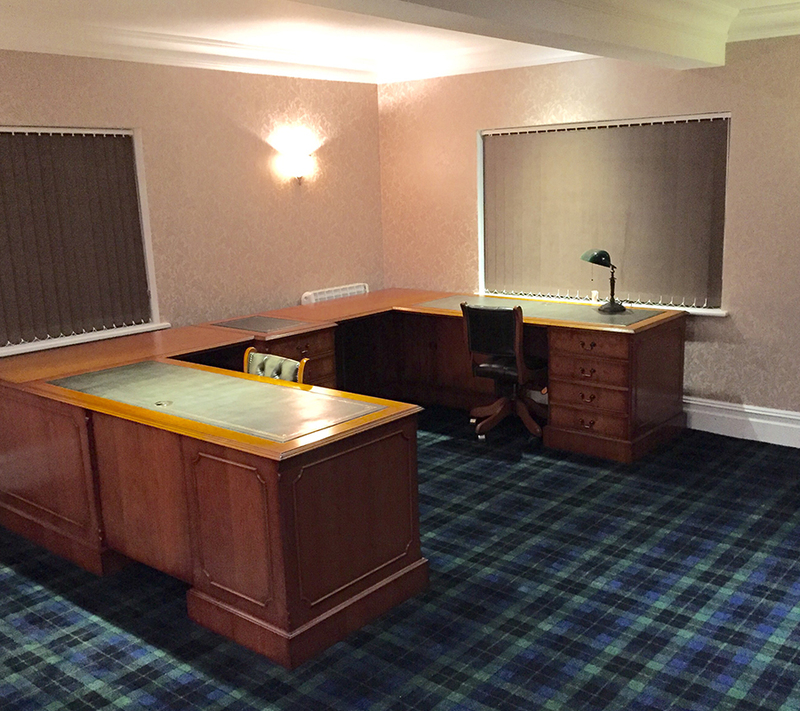 We also produced matching fire doors between the rooms to complement the furniture. An example of a reproduction style modular bookcase and desk that we manufactured in Yew to the clients own designs for their home office. 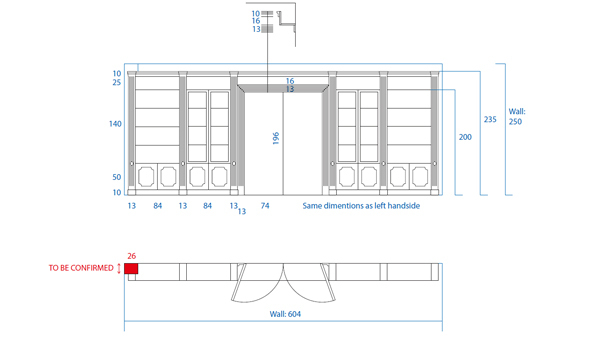 These pieces were all manufactured in modular pieces for easy transport but also for quick assembly on site. 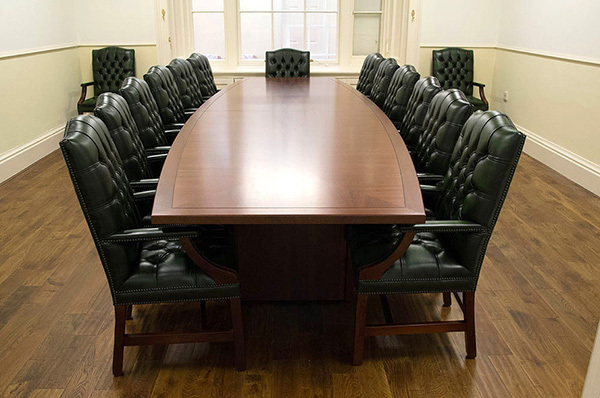 The chairs were also supplied and manufactured by Inadam Furniture with the same leather as used for the desk tops for a seamless match between all of the furniture items supplied. To see how these pieces were made, click here. 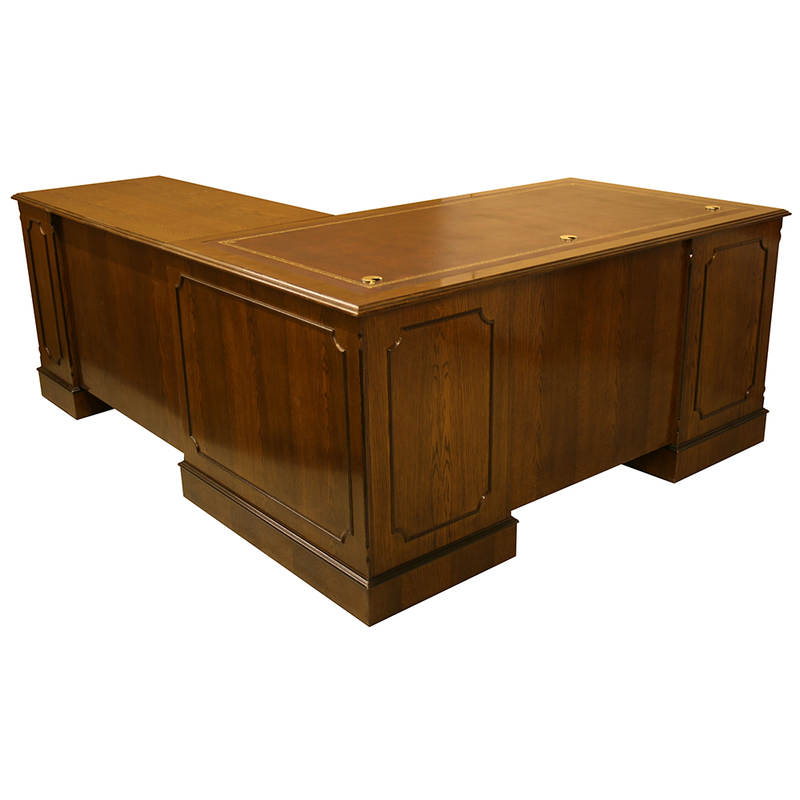 Example of a reproduction style television cabinet that we manufactured in a pattern colour mahogany finish to the customers own design. 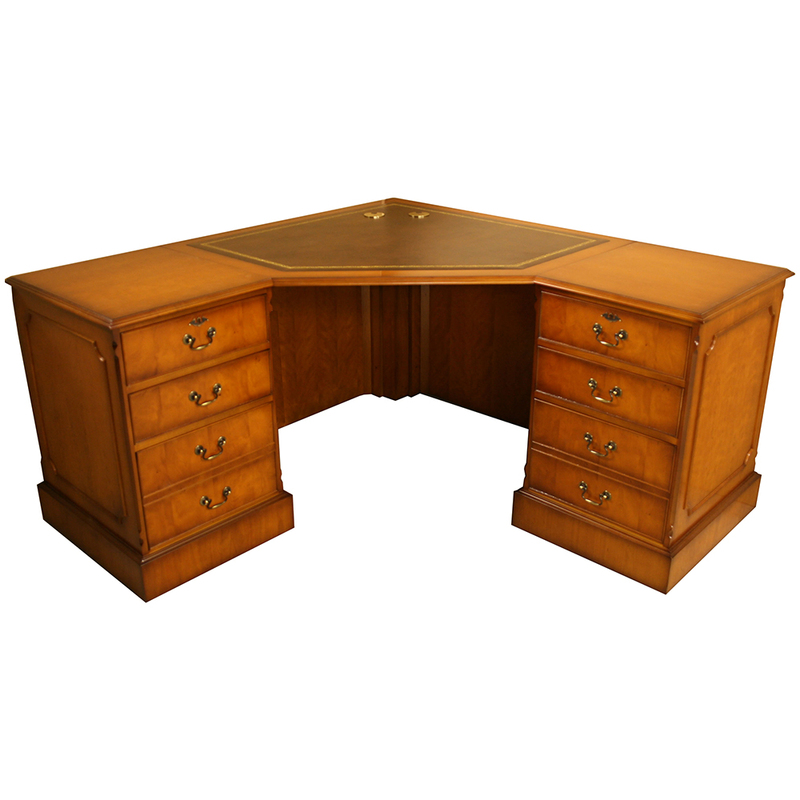 It was traditionally handmade within our own factory in Enfield. 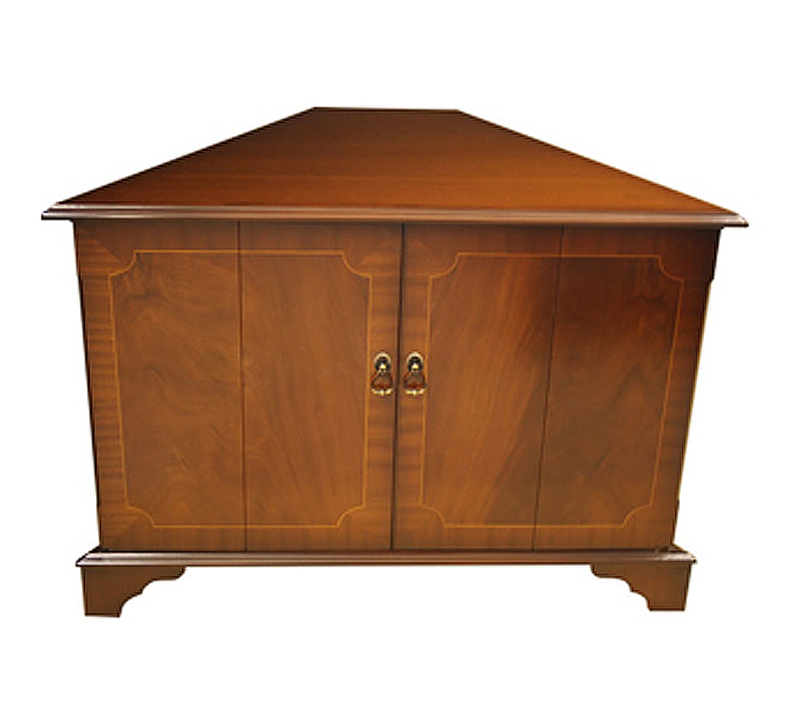 We can offer these cabinets in a range of wood finishes including Yew, Cherry, Oak, Poplar, Walnut and many other exotic wood finishes. 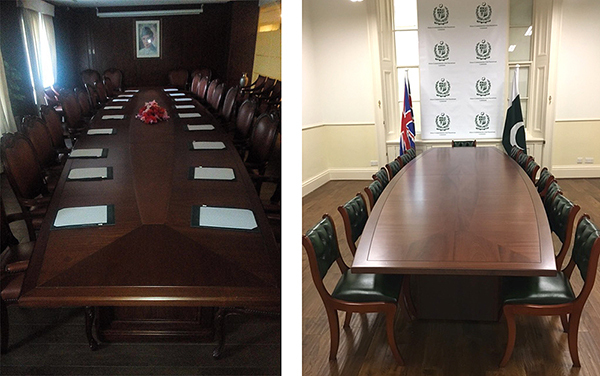 An example of a reproduction style conference table that we manufactured in Poplar with black line ebony inlays and a laser cut ebony inlay of the clients corporate logo. 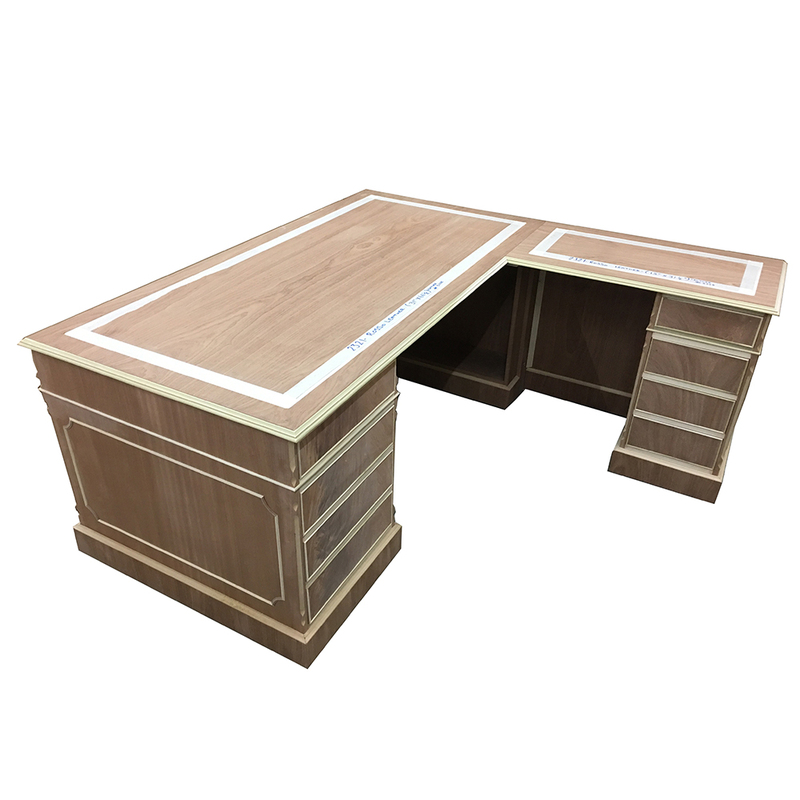 We are able to produce large, complicated cabinets to meet the needs of contract usage but we also have the capability to produce smaller every day pieces for the home such as desks, bookcases, occasional units and the full range of cabinet furniture. 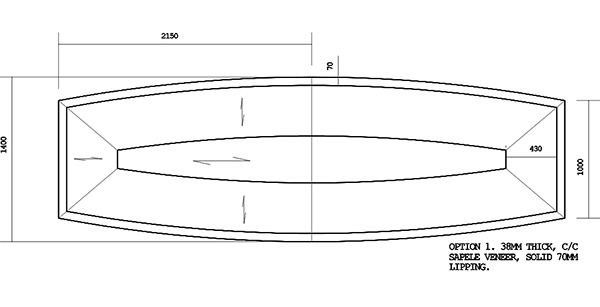 For more information on our bespoke services of for a free non obligation quote please contact us with your requirements, dimensions and if you have any rough sketches or drawings of what you have in mind. 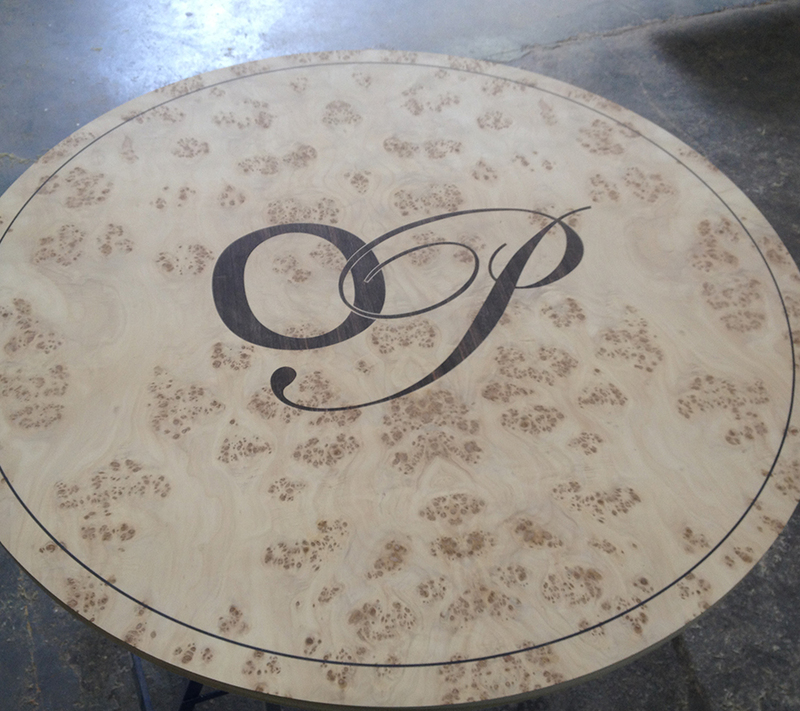 To see how this table was made, click here. 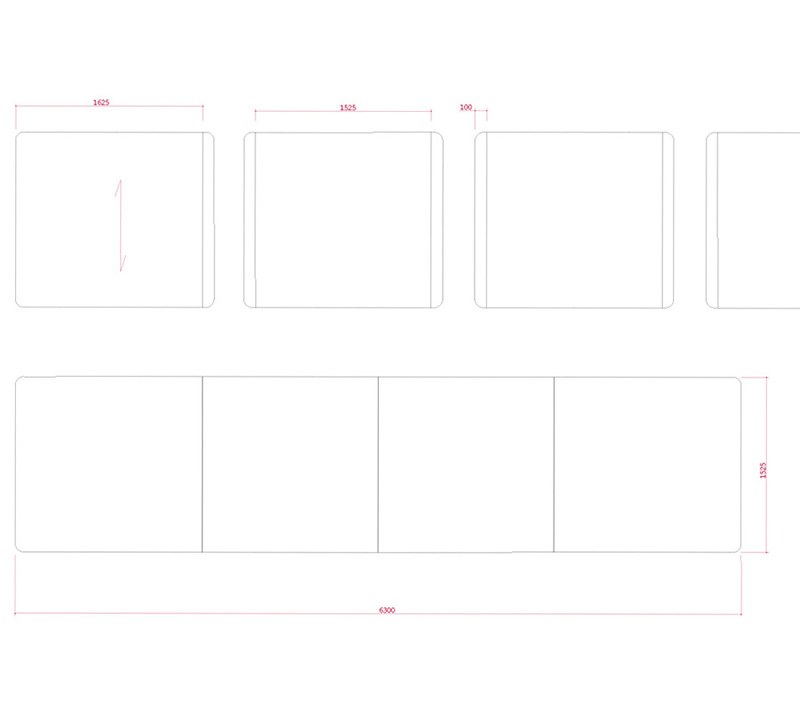 For this brief we were given a photograph of an existing table and the sizes that we needed to reproduce it in. The table had to be versatile to work with a couple of different styles of chair. 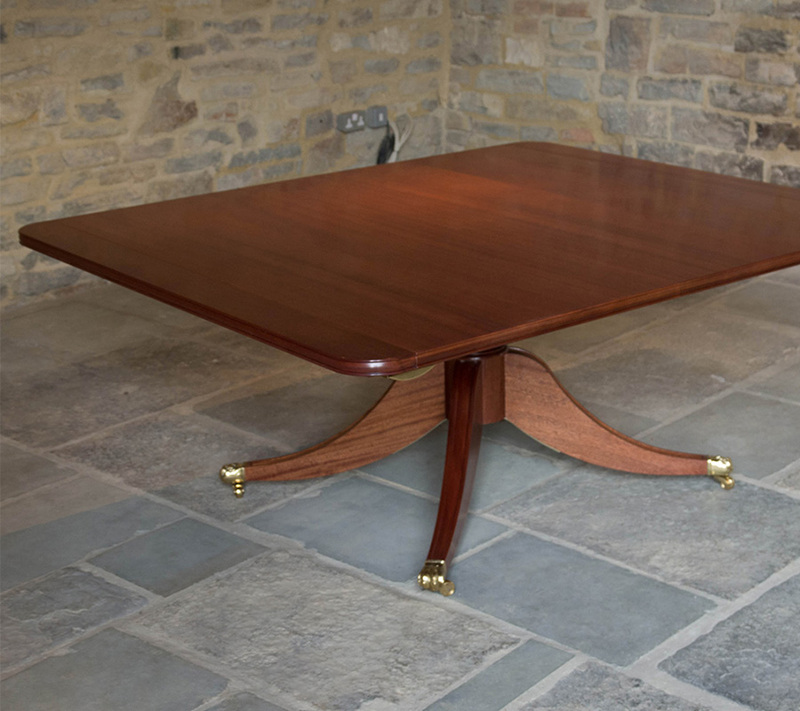 This table was handmade using a mix of veneered and solid mahogany edging to give the same design style as the original table pictured. The chairs supplied were our Enfield and Gainsborough chairs in a mahogany finish and antique green leather. 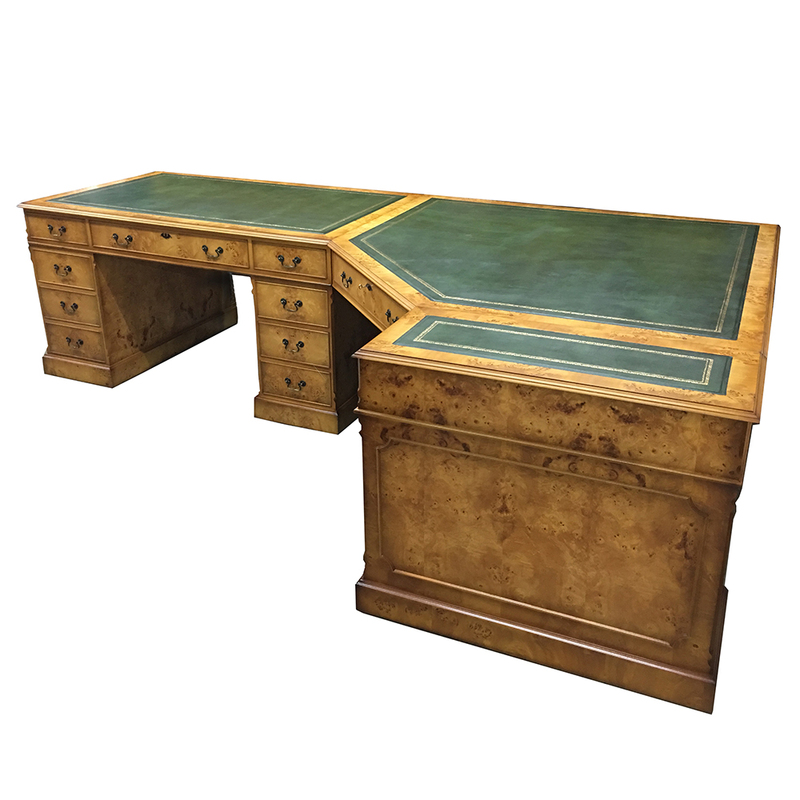 Here you will find some examples of ‘L’, ‘U’ Shape and Corner Desks manufactured within our factory in Enfield in a variety of styles, dimensions and wood finishes. 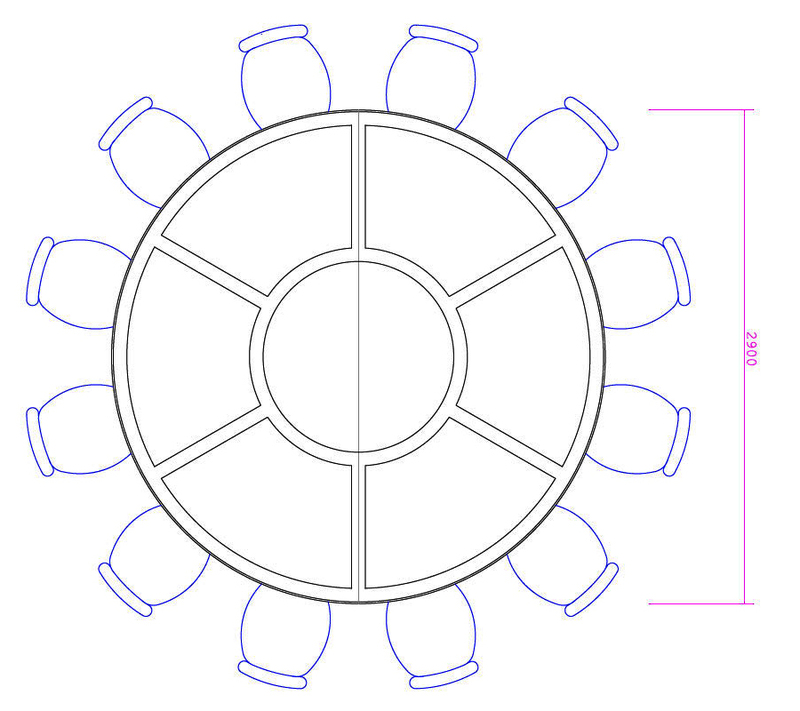 This should give you a good idea of what can be achieved to meet your own design brief.